Bruce Schneier at the Congress on Privacy & Surveillance (2013) of the École polytechnique fédérale de Lausanne (EPFL). Bruce Schneier (/ˈʃnaɪ.ər/; born January 15, 1963) is an American cryptographer, computer security professional, privacy specialist and writer. Schneier is a fellow at the Berkman Center for Internet & Society at Harvard Law School, a program fellow at the New America Foundation's Open Technology Institute. He has been working for IBM since they acquired Resilient Systems where Schneier was CTO. He is the author of several books on general security topics, computer security and cryptography. Schneier is also a contributing writer for The Guardian news organization. Bruce Schneier is the son of Martin Schneier, a Brooklyn Supreme Court judge. He grew up in the Flatbush neighborhood of Brooklyn, New York, attending P.S. 139 and Hunter High School. After receiving a physics bachelor's degree from the University of Rochester in 1984, he went to American University in Washington, D.C. and got his master's degree in computer science in 1988. He was awarded an honorary Ph.D from the University of Westminster in London, England in November 2011. The award was made by the Department of Electronics and Computer Science in recognition of Schneier's 'hard work and contribution to industry and public life'. Schneier was a founder and chief technology officer of BT Managed Security Solutions, formerly Counterpane Internet Security, Inc. In 1994, Schneier published Applied Cryptography, which details the design, use, and implementation of cryptographic algorithms. In 2010 he published Cryptography Engineering, which is focused more on how to use cryptography in real systems and less on its internal design. He has also written books on security for a broader audience. In 2000, Schneier published Secrets and Lies: Digital Security in a Networked World; in 2003, Beyond Fear: Thinking Sensibly About Security in an Uncertain World; in 2012, Liars and Outliers: Enabling the Trust that Society Needs to Thrive; and in 2015, Data and Goliath: The Hidden Battles to Collect Your Data and Control Your World. Schneier writes a freely available monthly Internet newsletter on computer and other security issues, Crypto-Gram, as well as a security weblog, Schneier on Security. The blog focuses on the latest threats, and his own thoughts. The weblog started out as a way to publish essays before they appeared in Crypto-Gram, making it possible for others to comment on them while the stories were still current, but over time the newsletter became a monthly email version of the blog, re-edited and re-organized. 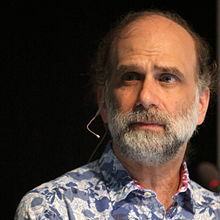 Schneier is frequently quoted in the press on computer and other security issues, pointing out flaws in security and cryptographic implementations ranging from biometrics to airline security after the September 11 attacks. Schneier revealed on his blog that in the December 2004 issue of the SIGCSE Bulletin, three Pakistani academics, Khawaja Amer Hayat, Umar Waqar Anis, and S. Tauseef-ur-Rehman, from the International Islamic University in Islamabad, Pakistan, plagiarized an article written by Schneier and got it published. The same academics subsequently plagiarized another article by Ville Hallivuori on "Real-time Transport Protocol (RTP) security" as well. Schneier complained to the editors of the periodical, which generated a minor controversy. The editor of the SIGCSE Bulletin removed the paper from their website and demanded official letters of admission and apology. Schneier noted on his blog that International Islamic University personnel had requested him "to close comments in this blog entry"; Schneier refused to close comments on the blog, but he did delete posts which he deemed "incoherent or hostile". Schneier warns about misplaced trust in blockchain and the lack of use cases, calling Blockchain a solution in search of a problem. "What blockchain does is shift some of the trust in people and institutions to trust in technology. You need to trust the cryptography, the protocols, the software, the computers and the network. And you need to trust them absolutely, because they’re often single points of failure." He goes on to say that cryptocurrencies are useless and are only used by speculators looking for quick riches. To Schneier, peer review and expert analysis are important for the security of cryptographic systems. Mathematical cryptography is usually not the weakest link in a security chain; effective security requires that cryptography be combined with other things. He attributes this to Bruce Schneier, who wrote in 1998: "Anyone, from the most clueless amateur to the best cryptographer, can create an algorithm that he himself can't break. It's not even hard. What is hard is creating an algorithm that no one else can break, even after years of analysis." Similar sentiments had been expressed by others before. In The Codebreakers, David Kahn states: "Few false ideas have more firmly gripped the minds of so many intelligent men than the one that, if they just tried, they could invent a cipher that no one could break", and in "A Few Words On Secret Writing", in July 1841, Edgar Allan Poe had stated: "Few persons can be made to believe that it is not quite an easy thing to invent a method of secret writing which shall baffle investigation. Yet it may be roundly asserted that human ingenuity cannot concoct a cipher which human ingenuity cannot resolve." Schneier is critical of digital rights management (DRM) and has said that it allows a vendor to increase lock-in. Proper implementation of control-based security for the user via trusted computing is very difficult, and security is not the same thing as control. Schneier is a proponent of full disclosure, i.e. making security issues public. If researchers don't go public, things don’t get fixed. Companies don't see it as a security problem; they see it as a PR problem. Schneier has said that homeland security money should be spent on intelligence, investigation, and emergency response. Defending against the broad threat of terrorism is generally better than focusing on specific potential terrorist plots. According to Schneier, analysis of intelligence data is difficult but is one of the better ways to deal with global terrorism. Human intelligence has advantages over automated and computerized analysis, and increasing the amount of intelligence data that is gathered does not help to improve the analysis process. Agencies that were designed around fighting the Cold War may have a culture that inhibits the sharing of information; the practice of sharing information is more important and less of a security threat in itself when dealing with more decentralized and poorly funded adversaries such as al Qaeda. Regarding PETN—the explosive that has become terrorists' weapon of choice—Schneier has written that only swabs and dogs can detect it. He also believes that changes to airport security since 11 September 2001 have done more harm than good and he defeated Kip Hawley, former head of the Transportation Security Administration, in an Economist online debate by 87% to 13% regarding the issue. He is widely credited with coining the term "security theater" to describe some such changes. As a Fellow of Berkman Center for Internet & Society at Harvard University, Schneier is exploring the intersection of security, technology, and people, with an emphasis on power. "Movie-plot threat" is a term Schneier coined that refers to very specific and dramatic terrorist attack scenarios, reminiscent of the behavior of terrorists in movies, rather than what terrorists actually do in the real world. Security measures created to protect against movie plot threats do not provide a higher level of real security, because such preparation only pays off if terrorists choose that one particular avenue of attack, which may not even be feasible. Real-world terrorists would also be likely to notice the highly specific security measures, and simply attack in some other way. The specificity of movie plot threats gives them power in the public imagination, however, so even extremely unrealistic "security theater" countermeasures may receive strong support from the public and legislators. Among many other examples of movie plot threats, Schneier described banning baby carriers from subways, for fear that they may contain explosives. Starting in April 2006, Schneier has had an annual contest to create the most fantastic movie-plot threat. Schneier has criticized security approaches that try to prevent any malicious incursion, instead arguing that designing systems to fail well is more important. The designer of a system should not underestimate the capabilities of an attacker, as technology may make it possible in the future to do things that are not possible at the present. Under Kerckhoffs's Principle, the need for one or more parts of a cryptographic system to remain secret increases the fragility of the system; whether details about a system should be obscured depends upon the availability of persons who can make use of the information for beneficial uses versus the potential for attackers to misuse the information. Secrecy and security aren't the same, even though it may seem that way. Only bad security relies on secrecy; good security works even if all the details of it are public. Schneier and Karen Cooper were nominated in 2000 for the Hugo Award, in the category of Best Related Book, for their Minicon 34 Restaurant Guide, a work originally published for the Minneapolis science fiction convention Minicon which gained a readership internationally in science fiction fandom for its wit and good humor. Schneier has been involved in the creation of many cryptographic algorithms. Cooper, Karen; Schneier, Bruce. "Minicon 34 Restaurant Guide", Rune Press, 1999. Bruce Schneier is a board member of the Electronic Frontier Foundation. ^ "Bruce Schneier | Facebook". Facebook. ^ "Bruce Schneier, CTO of Resilient Systems, Inc". ^ "IBM Security Closes Acquisition of Resilient Systems" (Press release). Armonk, NY, USA: IBM Security. 2016-04-06. ^ Schneier, Bruce (2016-02-29). "Resilient Systems News: IBM to Buy Resilient Systems". Schneier on Security. ^ Samuel Newhouse (February 9, 2009). ""Schneier on Security;" A Judge's Son Builds a Reputation of Cryptic Fame". Brooklyn Daily Eagle. ^ Drew Amorosi (July 11, 2011). "Interview: BT's Bruce Schneier". InfoSecurity. ^ Austin, Richard (12 March 2015). "review of Data and Goliath: The hidden Battles to capture your data and control your world". Cipher. www.ieee-security.org. Retrieved 18 March 2015. ^ Blood, Rebecca (January 2007). "Bruce Schneier". Bloggers on Blogging. Retrieved April 19, 2007. ^ a b c "Schneier on Security: Plagiarism and Academia: Personal Experience". Schneier.com. Retrieved June 9, 2009. ^ "ONLINE – International News Network". Onlinenews.com.pk. June 9, 2007. Archived from the original on April 7, 2010. Retrieved June 9, 2009. ^ SCHNEIER, BRUCE (2019-02-06). "There's No Good Reason to Trust Blockchain Technology". Wired. ISSN 1059-1028. Retrieved 2019-02-06. ^ "Was Bruce Schneier von Blockchain, IoT und Quantencomputern hält". www.netzwoche.ch (in German). Retrieved 2019-02-06. ^ a b Schneier, Bruce (1997). "Why Cryptography Is Harder Than It Looks". Retrieved 2011-04-08. ^ Ferguson, Niels; Schneier, Bruce. "Practical Cryptography: Preface". Retrieved 2011-04-08. ^ Cory Doctorow (2004-06-17). "Microsoft Research DRM talk". Archived from the original on 2006-12-02. Retrieved 2006-12-31. ^ a b Schneier, Bruce (2008-02-07). "With iPhone, 'Security' Is Code for 'Control'". Retrieved 2011-04-08. ^ "Charlie Miller's Punishment By Apple Tests A Complex Relationship" Huffington Post, 2011. ^ a b Schneier, Bruce (2005-09-08). "Terrorists Don't Do Movie Plots". Wired News. ^ a b Schneier, Bruce (2004-01-09). "Homeland Insecurity". Retrieved 2011-04-08. ^ Schneier, Bruce (2010-01-15). "Fixing intelligence failures – SFGate". SFGate. Retrieved 2011-04-08. ^ "International terrorism: AQAP tries again: Good intelligence work still leaves questions over airport security", The Economist, dated 12 May 2012. ^ "Berkman Center Announces 2013–2014 Community". Berkman Center for Internet & Society at Harvard University. July 8, 2013. Retrieved 8 July 2013. ^ Ben Makuch (8 October 2014). "2014 Will Not Be the Year of the First 'Online Murder'". Motherboard Vice.com. Retrieved 18 June 2015. ^ Schneier, Bruce. "Schneier on Security: Exploding Baby Carriages in Subways". And if we ban baby carriages from the subways, and the terrorists put their bombs in duffel bags instead, have we really won anything? ^ Schneier, Bruce. "Schneier on Security: Announcing: Movie-Plot Threat Contest". ^ Schneier, Bruce (2002-05-15). "Crypto-Gram: May 15, 2002". Retrieved 2011-04-08. ^ Doctorow, Cory. Little Brother. New York: Tor Teen, 2008, page 129. ^ "Hugo Awards Nominations". Locus Magazine. April 21, 2000. ^ "Minicon 34 Restaurant Guide" (PDF). Minnesota Science Fiction Society. ^ Jeschke, Rebecca (2013-06-27). "Renowned Security Expert Bruce Schneier Joins EFF Board of Directors". Retrieved 2013-07-06. Wikimedia Commons has media related to Bruce Schneier. Bruce Schneier on Real Law Radio, Bruce talks with Bob DiCello on the legal news talk radio program, Real Law Radio, about the case involving a Philadelphia school that allegedly spied on its students via the webcam on their computers (Podcasts/Saturday February 27, 2010). Roberts, Russ (June 10, 2013). "Schneier on Power, the Internet, and Security". EconTalk. Library of Economics and Liberty. This page was last edited on 20 April 2019, at 01:35 (UTC).